It seemed like it took about 6-7 minutes while using both of them. Next best thing to an end farm. Double Stone Generator is now online! It's literally 2 Smooth Stone generators outputting into one platform. It generates Smooth Stone fast enough to keep up with an Efficiency 5 Diamond Pick. They also feature independent on/off switches so if you only want to run one, or if two people want to share, you can! -Dont forget to PM me on the forums or contact a THP member in-game and get yourself added to the GateKeeper List for free access to our Double Blaze Farm, Villager Trade House (when it's finished) and Wither Farm (also when it's finished)! -The Stone Generator (there's two of them!) is cranking out Smoothstone like a beast! Come on by and collect some cobble (or smoothstone if you bring a silk touch pick) for free! -Villager Trade House construction is underway...although it will be quite a while (weeks?) before it is opened up for those on the GateKeeper Access List due to villager breeding being sloooow as hell. -Sugar Cane/Paper Farm (for all them emeralds!) is under construction on the main platform! -Apartment/Storage Space Building is nearing completion! -Slime Farm, Cactus Farm, Mob Farm and Iron Farm are operational, but are THP-Only for the time being. Announcements will be made if/when these become publicly available. First on the list would be the cactus farm as THP does not have a large need for green dye. -The Villager Trade House will be opening soon! I'm anticipating 1-2 weeks to get all of the neccessary villagers and security measures in place. Once the Villager Trade House is open anyone who has access to THP's GateKeeper Projects will be able to enter and trade with villagers (all trades will be unlocked and available). To find out how to be placed on the GateKeeper Access List, please refer to the very first post in this thread. -Due to the need to have emeralds on hand when trading with villagers we have constructed a Sugar Cane Farm below the Villager Trade House. This Sugar Cane farm will be accessed through a stairway inside the Villager Trade House and, as such, will require GateKeeper Access. To find out how to be placed on the GateKeeper Access List, please refer to the very first post in this thread. -Those visiting THP Land will notice two sugar cane farm towers being constructed in front of the Main Hall. These are now functional but are THP-Only access. Fear not! Those needing Sugar Cane are encouraged to re-read the previous paragraph and ask a THP member to be placed on the GateKeeper Access List! -The Tree Farm has been repaired, renovated and reopened! Bring your Bonemeal and Oak Saplings and enjoy fast, automated tree growing. Logs are stripped of leaves and stacked neatly into a giant block, making chopping a breeze! In the near future THP will supply all bonemeal, saplings, and iron axes needed to operate this machine. Credit to Jollysaintj for building this. -The Cactus Farm is now open!. Located just to the south of the Main Hall, this automated cactus farm spits out cactus blocks from the rear of the building via a water stream. Farming is as simple as standing in the water stream and catching the cactus! Fair warning...this farm is small and slow. We decided not to go nuts with its size due to the low demand for cactus and green dye. Nevertheless...we have a cactus farm! 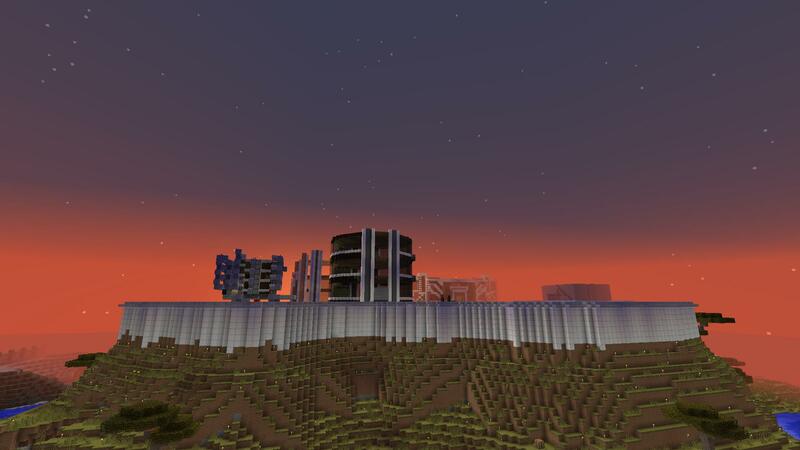 Credit goes to Goatskillz for building this and the other two buildings that cover our Iron Farm towers. -And lastly, THP's Apartment/Storage Building is now open!. Featuring 16 Units, those visiting THP Land for an extended period of time (whether you are new to the server looking to get established or a veteran simply needing to farm a large amount of materials) wishing to store their farmed items and/or temporarily set up residency can now reserve and use (for free!) one of our apartments/storage units. These units are incredibly large and come furnished with a bed and chests for storage of your items. Stay as long as you like, store as much as you can and farm as much as you want! Credit goes to Ubiwubikanubi for solo-building this thing. The Villager Trade House is NOW OPEN! There's only 4 villagers at the moment...but they have all the necessities. -The Butcher provides cheap and easy access to Cooked Beef and Cooked Pork (and leather armor if you want that). -The Blacksmith has ALL of his 26ish trades unlocked allowing you to trade your emeralds for Iron Armor and Tools and also Diamond Armor and Tools! You'll never have to mine again! -The Priest will provide you with Redstone, Glowstone, Bottles O' Enchanting and a few enchants for your iron and diamond tools. -The Librarian...the source of all your emeralds. Trade your paper (farmed below in the Sugar Cane Farm) to this guy for loads of emeralds to use with the other villagers for all those goodies! As a reminder...the Villager Trade House is a THP GateKeeper Project. To gain access to this building you must read and abide by the GateKeeper Rules listed in the OP and then contact a THP member to be added to the /allow list. Failure to comply with the GateKeeper Rules will result in your permanent removal from the /allow list. Our Automatic Watermelon Farm is now operational. This farm is located near the front of the Main Hall and all you have to do is push a button and collect your melons! Our Library Building has been completed (thanks to YoureBadGetMad). Head to this building for access to Brewing Stands, an Enchanting Table, and some sweet views to The Order's town, Annwyn! We've coordinated with The Order to open up an Inter-Organizational Waterway System. Bring your boat and take a scenic ride down a river connecting Ironforge (THP) to The Order's Bayside Area. One last thing, if you forget your pickaxe or tree axe, there are now dispensers at the Tree Farm and Stone Generator that can provide you with a free Iron Axe (Tree Farm) or Iron Pickaxe (Stone Generator) to use and keep! Last edited by Tautochrone on Sun Feb 16, 2014 4:47 pm, edited 1 time in total. - The bay area (or at least the builds around the bay area) are called Bayside. Thanks Rider, Updated those parts. Gotta say this is one of the most impressive towns i've seen on the server, I love the modern look. How'd you get all the iron for the walls, do you have an iron golem farm? 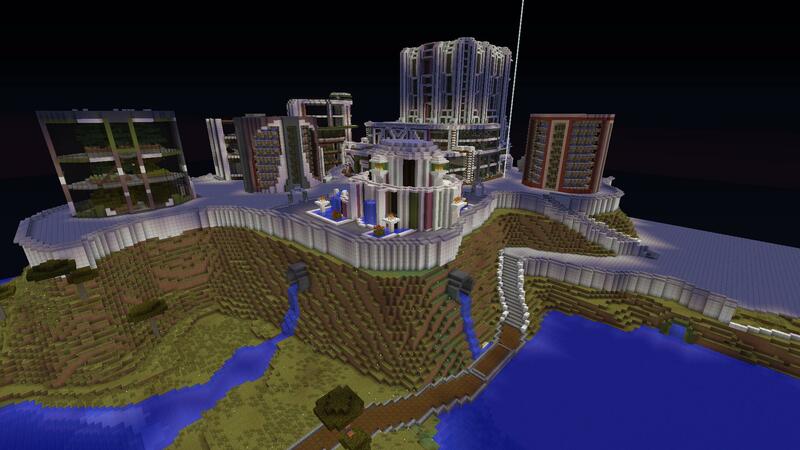 Nadastorm wrote: Gotta say this is one of the most impressive towns i've seen on the server, I love the modern look. How'd you get all the iron for the walls, do you have an iron golem farm? Yeah, around the "Main Hall" are 3 smaller buildings: The melon farm, cactus farm and cow farm. Those farms are literally built on top of Iron Farm towers (which we then covered with quartz/clay to make it look like a building) Actually the iron farm cell that has the cow farm on top of it hasn't been covered yet so the bare cobblestone cell of the that iron farm tower is still visible. Each tower has 2 "cells", one at bedrock and one right at the city platform....so 6 cells total. Since the city is literally built around those towers it produces iron golems throughout most of the afternoon/evening every single day. -It will be a GateKeeper Project (requires you to be on the GateKeeper Access List) since slime balls are a moderately rare item and because I feel like we need another GateKeeper Project. -We've axed any plans to make our chicken or cow farms public. With the ability to trade with our villagers (via Gatekeeper Access) for REALLY cheap cooked food, we see no reason to do it. Those without GateKeeper Access will have to deal with our free, delicious melons. -Our Gold Farm is up and running but don't worry...it, like our Iron Farm, will never be made public...sorry guys. They really aren't even hard to build anymore now that you can make GIANT portals. Hit me up if you want to buy some Obsidian and build your own...you only need about 18 stacks of Obsidian. 1) THP Vending Machines: Located right at the entrance to Ironforge City, THP will be offering vending machines that will provide Iron Armor and Iron Tools (and some other necessities) to residents and patrons of Ironforge City absolutely free. That's right, any iron tool, any piece of iron armor, free. Keep in mind, those wishing to upgrade to Diamond Armor/Tools can become GateKeeper members (for free!) and use our Public Villager Tradehouse to get any Diamond Tool and any piece of Diamond Armor, again, absolutely free. You'll literally never have to pay ANYTHING for armor/tools ever again! We're going to start this out as completely, 100% public...but will convert it to a GateKeeper Project if abuse becomes rampant. 1) Fish Farm: Located on the 2nd floor of the Main Hall, the Fish Farm allows you semi-AFK while you farm fish! It does NOT get around the AFK Kick server plugin but allows mindless automatic fish farming up until you get AFK kicked. It's very "bare bones" at the moment but we'll be putting a structure and instructional signs around it very shortly. Oh yeah, basic fishing poles will be provided for in the near future but you're more than welcome to bring and use your own enchanted fishing pole! 2) Obsidian Farm: We haven't mentioned this farm before because we weren't sure if anyone would ever need it...but with Gold Farms being easier than ever to build we decided that 1) We needed one and 2) We should make it public. It's also located on the 2nd floor of the main hall and will have signs with operating instructions in the near future. DON'T FORGET TO BRING YOUR DIAMOND PICK! 1) Slime Farm: I mentioned this in the previous update. We're still trying to figure out a sensible way to make this farm-able for someone standing in it but also auto-collect when nobody is actively using it. It'd be very easy if it wasn't sitting on bedrock but I'm still hopeful we can find a solution. 2) Spider Farm: We've finally located some spider spawners that we can build into a usable XP grinder. It's only a double spider spawner but it will provide newcomers to the server a chance to gain some levels and enchant their armor and tools to give them another leg-up at thriving once they feel ready to move out on their own into the wilderness. Gold Farm: Don't get too excited about this one... Those who visit Ironforge will notice a rather large Gold Farm on the Lower Platform. For the foreseeable future it will remain like the Iron Farm, THP-Only Access. We currently have no plans to open it up to the public (this is includes the GateKeeper Access List). Just wanted to mention it so we don't get bombarded with questions. I've even made aware by a few people that I've forgotten to give them gatekeeper access after saying i would. If you want Gatekeeper Access or I've forgotten to add you to the list please contact me in game or send me a PM on the forums and remind me. Tauto, two things. First off, can we join a subway line from our place to yours? We will follow your design and provide the materials. Second, what will happen to the villager trading house? Most of our economy was built off of that since our mining area is barren due to us stripping it out. If it isn't working at this time, which I doubt it is, then might want to mark it as closed in the OP. Anyway, liking the new name, I never knew it was renamed, but its much better than THP Land. Note: the only reason why I am suggesting a line from Ironforge to Xryro HQ is that we have a public Iron/gold farm, and a spider/skeleton grinder. We could team up for public access stuff and increase traffic to both areas. Two links are stronger than one. I imagine the trading area is back up and running. If not it'll happen so soon it's nothing to worry about. 128keaton wrote: Tauto, two things. First off, can we join a subway line from our place to yours? We will follow your design and provide the materials. Second, what will happen to the villager trading house? Most of our economy was built off of that since our mining area is barren due to us stripping it out. If it isn't working at this time, which I doubt it is, then might want to mark it as closed in the OP. Anyway, liking the new name, I never knew it was renamed, but its much better than THP Land.